A recap of Week 13 in the NFL – three of Sunday’s games was decided on the final play of regulation, or overtime. We’ll start with those. PACKERS 38, GIANTS 35 — Our “Game of the Day” will no doubt get some votes for “Game of the YEAR” when all is said and done. Green Bay and New York combined for nearly 900 yards of total offense. Let’s jump right to crunch time. Trailing by eight in the final minute, Eli Manning threw a two-yard touchdown pass to Hakeem Nicks. The Giants made the two-point conversion to tie the game, but then Packers quarterback Aaron Rodgers got the ball at his own 20 with 0:58 left on the clock. It only took two big plays for him to lead his team into field goal range. Mason Crosby kicked the game-winning, 30-yard field goal, as time expired, and yes, the Packers improved to [12-0]. Rodgers threw four touchdown passes, while Manning tossed three. CARDINALS 19, COWBOYS 13 (OT) – What a wild ending in Glendale, Arizona, and one that will be talked about a lot in Dallas for the next few days. With 0:07 remaining, Dan Bailey was lining up for a game-winning field goal attempt. A timeout was called to ice the kicker. But, the stoppage was called by Dallas head coach Jason Garrett. Bailey’s kick, which went through the uprights, did not count. He had to try it again, and came up short. Arizona got the ball to start overtime, and Kevin Kolb hit Larod Stephens-Howling, who danced through the Cowboys’ defense and into the end zone for a 52-yard, game-winning score. And it’s all because Jason Garrett iced his own kicker, wow! BRONCOS 35, VIKINGS 32 – Don’t look now, but Denver is now tied for first place in the AFC West. And once again, Tim Tebow led his team from behind. He threw for 202 yards and two touchdowns. Then after the Broncos picked off Christian Ponder with less than two minutes remaining, they marched down the field and Matt Prater kicked a 23-yard field goal as time expired. Tebow is now [6-1] as the Broncos’ starting quarterback. TITANS 23, BILLS 17 – Chris Johnson is finding his groove. He ran for 153 yards and two touchdowns in Tennessee’s victory at Ralph Wilson Stadium. Johnson has rushed for over 100 yards in three of his last four games. CHIEFS 10, BEARS 3 – While this was hardly the best game of the day, it may have featured the play of the day or maybe it was just Kevin Harlan’s voice that made it special. The only touchdown of the contest came on the final play of the first half, when Tyler Palko’s “Hail Mary” pass landed in the arms of Dexter McCluster. Chicago suffered a significant blow when Matt Forte left the game with a right knee injury. DOLPHINS 34, RAIDERS 14 – Here’s the upset of the day. In Miami, the Dolphins made it look easy against the first-place Raiders. Reggie Bush ran for 100 yards and a touchdown. Miami scored two touchdowns within 20 seconds of each other in the third quarter. PATRIOTS 31, COLTS 24 – They love Rob Gronkowski in Foxboro, Massachusetts, as the tight end scored three more touchdowns, giving him 13th touchdown receptions on the season. His other score was a rushing TD on a lateral. The Pats built a big lead, and then hung on as the Colts scored 21 points in the fourth quarter. Indianapolis is now [0-12], while New England is [9-3]. PANTHERS 38, BUCCANEERS 19 – This was all about Cam Newton. Carolina’s rookie quarterback rushed for three touchdowns and threw for another at Raymond James Stadium. Josh Johnson started at quarterback for Tampa Bay in place of the injured Josh Freeman. The Bucs, who at one time were [4-2], and in first place, have lost six in a row. JETS 34, REDSKINS 19 – At FedEx Field, the Jets kept their playoff hopes alive by rallying for 21 points in the fourth quarter. Mark Sanchez found Santonio Holmes for the game-winning touchdown with 4:49 to play. Washington has lost seven of its last eight. TEXANS 17, FALCONS 10 – It doesn’t matter who’s playing quarterback for Houston; the Texans keep on winning. Rookie quarterback T.J. Yates played mistake-free football, and Arian Foster rushed for 111 yards and a touchdown. Atlanta QB Matt Ryan’s last-second pass in the end zone fell incomplete. 49ERS 26, RAMS 0 – We have our first division winner. San Francisco wrapped up in the NFC East with an easy victory at home over St. Louis. Alex Smith threw two touchdown passes, while Frank Gore ran for 73 yards, and became the franchise’s career rushing leader. RAVENS 24, BROWNS 10 – Neither a driving rainstorm nor Cleveland’s defense could slow down Ray Rice. The Baltimore running back broke loose for a career-high 204 yards, as the Ravens remained in first place in the AFC North. They own the tiebreaker over the Steelers. Have you been impressed by Cam Newton this season? If so, why? Cam Newton has been quite impressive this season and it’s only been two games. The rookie gunslinger currently ranks second in the NFL behindTom Brady with 845 passing yards, and has also tossed three touchdowns and four interceptions too. “Going into the game, coach asked us as a quarterback, [what are] the things that it’ll take to win and I don’t think I followed the number one rule and that was protect the football,” Newton said via the Carolina Panthers website. OK, he may not be the second coming of Joe Montana or Brett Favre 2.0, but all in all, he’s been quite impressive these past few weeks despite not earning a single win in the standings. Against the Arizona Cardinals in week one, Newton registered three touchdowns, two in the air, and one on the ground, while his defense struggled against Kevin Kolb’s offense. Also, Newton complete 24-of-37 passes for 422 yards, but again, his team didn’t win. This past Sunday against the Green Bay Packers, Newton helped the Panthers earn an early lead before it was erased by Aaron Rodger’s offense. Newton struggled in the second half, as well as recorded three interceptions. Although, while he showed his first-year true colors during the Panthers second game of the season, he did admit that he can’t turn the ball over or make decisions that’ll hurt his team. Newton and the Panthers will eventually get their first win of the season and while they may not win a lot of games this year, it certainly seems that Newton will continue to improve, as well as excel under the guidance of head coach Ron Rivera. “Our coaches do an excellent job of getting us in the best play possible and it’s my job personally as a quarterback to make everything right. Whether it’s throwing the ball deep – throw it to the man or just checking the ball down. [You] can’t be greedy in this league and it’ll come back to bite you every single time,” Newton said. Newton and the Panthers will look to earn their first win this Sunday against the Jacksonville Jaguars at home and who knows, maybe the rookie gunslinger will rack up yet another 400-yard day. Will Sam Bradford take the next step this season? We'll wait and see! 1.) St. Louis Rams [9-7] – Is this the year the Rams return to the playoffs? Quarterback Sam Bradford showed tremendous progress last year, coming up just short of a division title. He appears to be the best quarterback in what’s shaping up to be yet another weak division. Defensive end Robert Quinn, the team’s first-round draft pick, should help bolster the pass rush. 2.) Arizona Cardinals [8-8] – This is Kevin Kolb’s team now. And the Cards will take anything as an improvement over last year, when they were near the bottom in passing yards and rushing yards. Larry Fitzgeraldmade waves during the offseason when he signed an 8-year, $120 million contract. But Arizona needs a lot more help on both sides of the ball to be a contender. 3.) Seattle Seahawks [6-10] – A lot of people are still wondering how the Seahawks not only won the division last year, but also won a playoff game. But this year will be different. Matt Hasselbeck is gone. Tavaris Jackson is the starter. Just how effective will he be? Does he have enough help around him to carry the load? They used their first-round pick on offensive tackle James Carpenter. There are just too many holes that this team needs to fill, and Seattle did not do a good job of filling them during the offseason. 4.) San Francisco 49ers [5-11] – A lot has changed in San Francisco. Jim Harbaugh is the coach. There are new offensive and defensive coordinators. Alex Smith gets another shot to be the starter at quarterback. He hasn’t done much in the pros, and there’s no reason to believe that will change in 2011. Fortunately they have Frank Gore at running back. Expect to see a lot more carries from him. 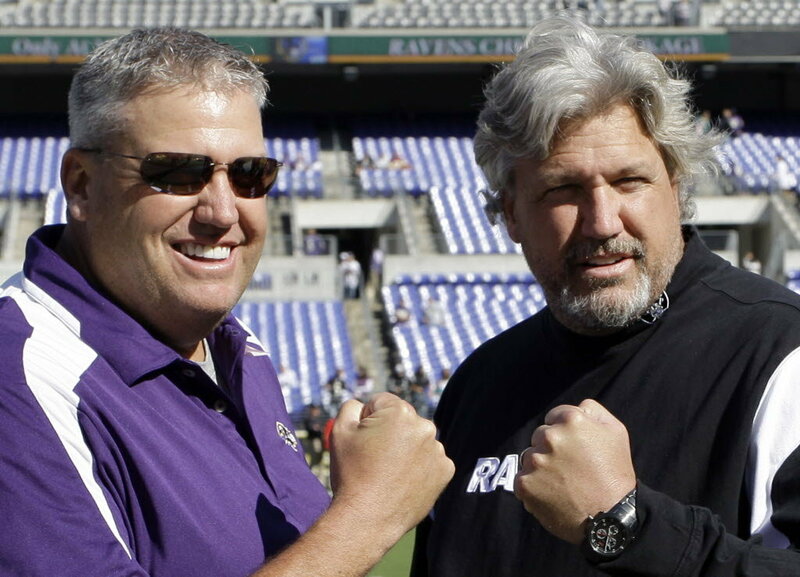 Rex Ryan (left) and Rob Ryan (right) are ready to lead their teams to the top! The NFL regular season is finally here, which means it is time to preview 10 marquee matchups to watch this season, so make sure you mark these dates on your calendar. Dallas at New York Jets (Week 1) – Rob Ryan vs. Rex Ryan will be the headline for this particular matchup. Both Ryan brothers competed against one another last year; however, Rex’s Jets came out on top. Perhaps that’s some fuel on the fire for Rob Ryan’s defense and the Cowboys? San Diego at New England (Week 2) – Both teams met against one another in week two of the ’07 season, but this time, Adalius Thomas won’t be on the field. Does that mean Jerod Mayo will attempt a pick-six against Chargers quarterback Philip Rivers? Anything’s possible. Philadelphia at Atlanta (Week 2) – Michael Vick returns to Atlanta, Georgia on “Sunday Night Football.” Yet, one might wonder if Falcons owner Arthur Blank will want to shake Vick’s hand before or after the game? Also, does Blank and Vick still exchange hand written letters too? Pittsburgh at Indianapolis (Week 3) – Former Colts head coach Tony Dungy believes Indianapolis will be doomed this season due to Peyton Manning’s health. If that’s the case, the Colts should lose this game. In fact, if the Colts lose this game, they’d be [0-3] at this point, right? New York Jets at New England (Week 5) – You know deep down that Patriots head coach Bill Belichick has this game circled on his calendar. In fact, I bet he’s talking to his barber, dentist, doctor and owner Bob Kraft about this particular meeting. In fact, he’s definitely talking to Kraft, who criticized his team’s game plan last year in the playoffs against the Jets. Dallas at New England (Week 6) – The last time the Cowboys invaded Gillette Stadium, Quincy Carter was the quarterback and Bill Parcells was the head coach. Also, Dallas hadn’t won a playoff game either, but this time around, Jason Garrett is the man who walks the sidelines, while Tony Romo calls the plays under center. The Cowboys have indeed won a playoff game, (’09 against the Philadelphia Eagles), but should definitely consider this a must-win contest, especially against an elite team. Eli Manning and the New York Giants may have beat the Patriots in Super Bowl XLII, but can they do it again at Gillette Stadium this season? New York Giants at New England (Week 9) – Expect Belichick and his team to look for revenge against the squad that ended their prefect season in Glendale, Arizona in ’07. Also, hopefully the Patriots defensive will be able to tackle Giants quarterback Eli Manning too. Arizona at Philadelphia (Week 10) – Kevin Kolb returns to the “City of Brotherly Love.” Don’t expect Kolb to be the guaranteed starter in this game, but I’m sure there’ll be a decent amount of “boos” and jeers toward Kolb and his Cardinals. San Francisco at Baltimore (Week 12) – Once again, it’s another brother vs. brother meeting, as John Harbaugh’s Ravens host Jim Harbaugh’s 49ers. The Ravens should have the upper hand in this particular matchup; yet, you just don’t know what quarterback Alex Smith might do for San Francisco. New York Giants at New York Jets (Week 16/Christmas Eve) – Santa Clause, Rex Ryan, Mark Sanchez and Fireman Ed will be incredibly jolly during this contest, but who knows, maybe Giants head coach Tom Coughlin won’t be so nice and lead his New York team to victory. Just for Fun – The Chicago Bears will travel to Detroit, Michigan over Columbus Day Weekend to take on the Lions under the “Monday Night” lights, which certainly should be an interesting affair. Hey, when was the last time the Lions appeared on a major stage like “Monday Night Football?” All in all, let’s keep our fingers crossed that quarterback Matthew Stafford remains healthy this season too. New England Patriots running back Stevan Ridley was rather impressive on Thursday against the Jacksonville Jaguars. Quick hits – from around the NFL. Dallas Cowboys head coach Jason Garrett admitted that “it was nice to win” on Thursday, as his team rallied to defeat the Denver Broncos, 24-23. However, despite the limited performance of starting quarterback Tony Romo, back up Stephen McGee left fans wondering, if he’s someone the squad can rely on down the road? It’s way too early to answer that particular question, yet, it’s quite possible that one day, McGee could be the starter, but he needs to do more than convert on two-point conversion plays. McGee finished the game with 208 yards, three touchdowns and one interception. Broncos head coach John Fox was pleased with quarterback Tim Tebow’s on-field presence, however, I think it’s an obvious that Kyle Orton will retain his starting job. Orton completed two-of-six passes for 37-yards, while Tebow finished the game with 91 yards, but no touchdown. In fact, former Notre Dame star, Brady Quinn ended his evening with one touchdown pass to Eron Riley, but who knows if either player will make the final cut. The New England Patriots were rather hot on Thursday, as they beat up the Jacksonville Jaguars, 47-12. Tom Brady, Chad Ochocinco and Wes Welker suited up, but instead, watched backup quarterbacks, Brian Hoyer and Ryan Mallet combine for 335 yards, two touchdowns and no interceptions. Yet, despite the successful play of both quarterbacks, running backsStevan Ridley and Richard Medlin combined for four rushing touchdowns. However, the Patriots did encountered some negative issues, which included fumbling the ball twice, as well as special teams struggles, such as kicking the ball out of bounds and mishandling snaps. Although, I am sure head coach Bill Belichick has told his team that’s unacceptable. Jaguars quarterback Blaine Gabbert struggled in his NFL debut, as he finished the game with nine completions. Gabbert didn’t register a single touchdown or interception too. *Philadelphia Eagles running back Ronnie Brown rushed for 22 yards on nine carries, as well as recorded one catch for seven yards. Michael Vick and Vince Young combined for 119 yards and one touchdown strike to tight end Brent Celek.